Since spiritual gifts are God’s special empowerment for us to do ministry, it is important we look for people with the appropriate spiritual gifts for the varying ministries in the church. As already mentioned, job descriptions should reflect a need for God’s power. This can be accomplished by stressing personal growth expectations on the ministry description but also by listing the appropriate spiritual gifts under qualifications. 1) Having the spiritual gifts most used in the ministry listed in the job description helps in recruiting and placing the right people into ministry. You can use the job description to point people to the spiritual gifts they ought to have to do the ministry but don’t stop there. Stress why this is an important qualification. — You are looking for people God has given his special divine empowerment to serve in this way because it needs to be His power at work for them to be effective. 2) The spiritual gifts listed on the job description can be a point of reference when using job descriptions for staff evaluation. One of the purposes of staff evaluation is to make sure people are a good fit. It is particularly critical to refer back to the spiritual gifting qualification in the first evaluation you have with someone. — You are finding out if the ministry is a good fit based on spiritual gifts. Sometimes it is not until after a person spent some time serving that they either confirm gifting or discover that it is not a good fit. Does the power of God seem to be evidenced as they serve because they are so gifted? 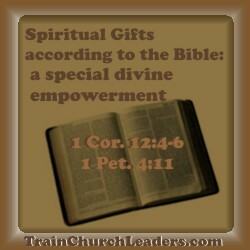 3) Using the spiritual gifts listed on the job description can assist in learning how to support people in ministry. The Apostle Paul told Timothy to “fan into flame the gift of God” (2 Tim. 1:6) that was in him, suggesting that we can grow in the use of our spiritual gifts. Struggles in ministry are not always because the person does not have the right spiritual gifting but because they still have some growing to do in its use. How can you help fan into flame the gift(s) within them? — You are aiming at helping people tap more and more into God’s power, not mere self-improvement. ← Previous Previous post: Building Equals Increased Testimony?